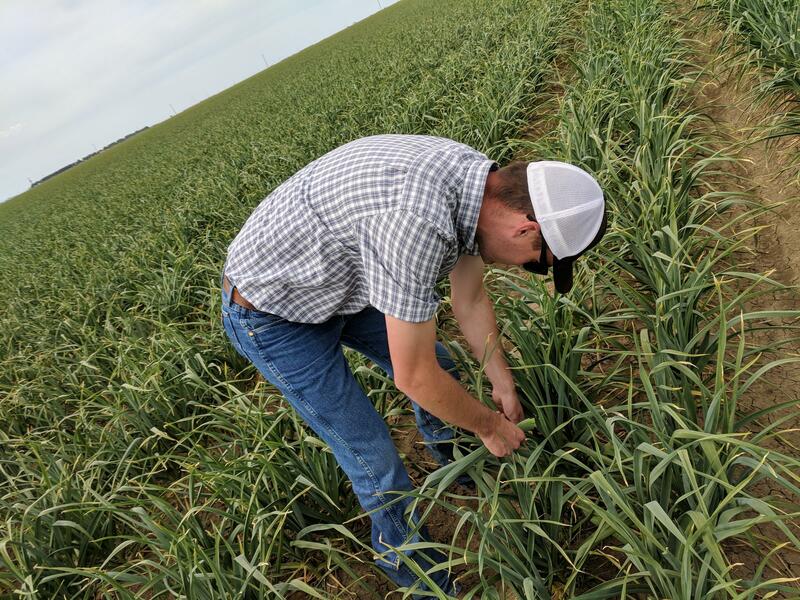 Jon Hubble regularly collects tissue samples from Valley agricultural fields, like the garlic seen here, to test for water content and nutrients like nitrogen. The San Joaquin Valley struggles with environmental pollution. Hundreds of thousands of residents are served with water that’s unsafe to drink, and all of us live under seasonal clouds ozone and particle pollution in the air. Water and air problems are regulated separately, but one contaminant bridges both domains. This story examines why nitrogen is such a persistent problem. Every other Wednesday, Jon Hubble carefully crosses a field of garlic, plucking leaves off of tall, green stalks. “It’s one, two, three, and this would be your most recently matured leaf,” he says, demonstrating how he chooses which leaves to collect. Hubble works for an agronomist in Fresno, sampling crops and soils and sending them off to a lab for testing. It’s what brings him to these rows of garlic in Five Points, on the west side of Fresno County. “One of the perks of onions and garlic: It at least smells good,” he says. The test results get sent back to growers like John Diener, who farms 4,000 acres of tomatoes, onions, grapes, and the garlic Hubble is sampling today. Every few weeks, Diener pores over those lab results. “I do tissue samples on my crops primarily because I don't want to overspend on nitrogen,” he says. 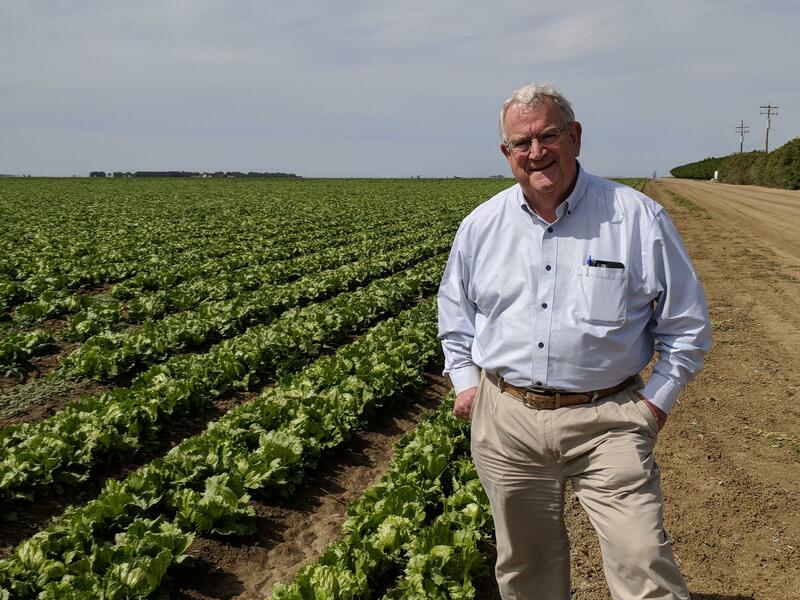 John Diener, who farms 4,000 acres on Fresno County's west side, has been taking tissue samples of plants for decades – a practice that helps keep fertilizer costs down but also helps minimize runoff of excess nitrate into groundwater. Nitrogen: An essential ingredient of fertilizer that helps plants grow and can increase yield. These data help Diener tailor how much fertilizer to apply. But Diener knows carefully applying nitrogen doesn’t just help his crops. It also helps protect groundwater. You see, nitrogen leads a double life: It is a critical plant nutrient, but over the last few decades, we’ve come to realize nitrogen poisons water. And emerging research shows it’s a contributor to air pollution. These impacts have spurred on a massive effort to train growers to reduce their nitrogen footprint. “The nitrogen usage on the farm, the farmers have always been aware of,” Diener says. “What has accumulated in the soil over the eons they're not.” But even with additional attention, it’s extremely hard to fix, and it’s become a lingering problem. Nitrogen is a major component of not just fertilizer, but also sewage and manure. Any nitrogen not sucked up by plants can get picked up by water and converted into nitrate. Nitrate can leach into soil and underground aquifers—which we drink from. “Nitrates in drinking water can cause a whole host of problems,” says Debi Ores, a staff attorney with the non-profit advocacy group Community Water Center. Those range from blue baby syndrome, in which babies don’t receive enough oxygen, to blood disorders and reproductive complications. A 2012 UC Davis study estimated that more than 250,000 people in Central California were at risk of public health problems from nitrate exposure. Since then, almost 300 water systems have had issues with nitrate, impacting as many as 390,000 Californians statewide. “This is a problem that’s not going away and it is impacting more and more communities every day,” says Ores. 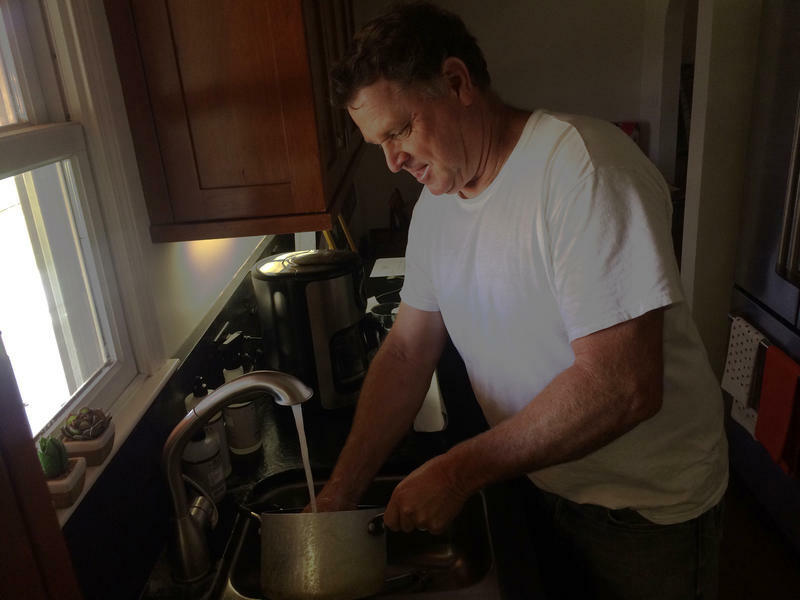 The state water board has been regulating nitrate in drinking water in some form since 1977. But in 2012 it instituted an ambitious set of regulations to tackle the biggest source of nitrate: Agriculture. It’s part of the Irrigated Lands Regulatory Program, which involves 30,000 growers in the Central Valley. “Those orders probably represented one of the most significant changes in how the regional board and the state boards regulate nitrogen discharges that could affect groundwater,” says Patrick Pulupa, executive officer of the Central Valley Water Board. The regulations require growers to create nitrogen management plans in an effort to apply only as much as the plants need. Many growers like John Diener have been doing this for years. But Pulupa says the program has helped growers understand the greater impacts of over-application. And he says many have changed their practices. “The communities that they depend on for their farm work are the same communities that may be drinking impacted water, so it’s best to work toward solutions that work for everyone,” he says. Jay Lund, director of the UC Davis Center for Watershed Sciences, agrees progress is being made. But he warns: We’ve still got a long road ahead of us. Unlike other contaminants, nitrate sticks around in the water supply for generations—becoming a legacy problem. A new study aims to quantify the social costs of nitrogen fertilizer. San Joaquin Valley residents are likely familiar with nitrates that seep out of agricultural fields and into the water supply. But nitrogen also makes its way into the air and the environment, impacting human health, ecosystems, and the climate. And all those exact costs on society.